Resources > Articles	> [Guide] How Much Will a Successful Loyalty Program Cost You? [Guide] How Much Will a Successful Loyalty Program Cost You? You’ve decided to run a loyalty program and you already have great ideas for every aspect of the customer experience, from rewards to in-store events. But one critical question that all companies face is: How much will the loyalty program cost? Many of our clients ask our team what kind of costs to expect in a loyalty program so they can better plan according to their budget. If you’re feeling like cost is a grey area, don’t worry. We’re here for you. Here is a checklist (with a worksheet, an ebook and a video among other things) to help you begin calculating loyalty-related costs. It’s not all-inclusive, since no two loyalty programs are alike, but it’s a great place to start. I’ll also share some tips for making your plan budget-friendly. So grab a notepad and a pencil, and let’s get calculating! Technical research for loyalty program implementation: You might use a loyalty management platform like Antavo, consult an agency, or create your own program from scratch. In any case, this decision requires time for research and consultation. Preparations to create the loyalty program structure: This includes planning and/or sourcing rewards, determining customer tiers, planning segmentation and scheduling marketing communication. Plan for a post-launch strategy: You’ll also need to invest time in your program after it launches. Plan to spend time on getting customer feedback about the program, and regularly updating your rewards program to keep it fresh. Cost of the reward: It can be a custom product, an event ticket, a VIP service, a product that has been in your inventory for a long time, etc. Each item and experience has a base price – including the time and energy spent with the design team – which needs to be considered. The cost of delivering the reward: If you’re working with physical products, be sure to consider the cost of shipping. You can reduce costs by shipping a reward with the customer’s next purchase. One of the most important elements of a loyalty program is the rewards (which can include both monetary and experiential rewards). 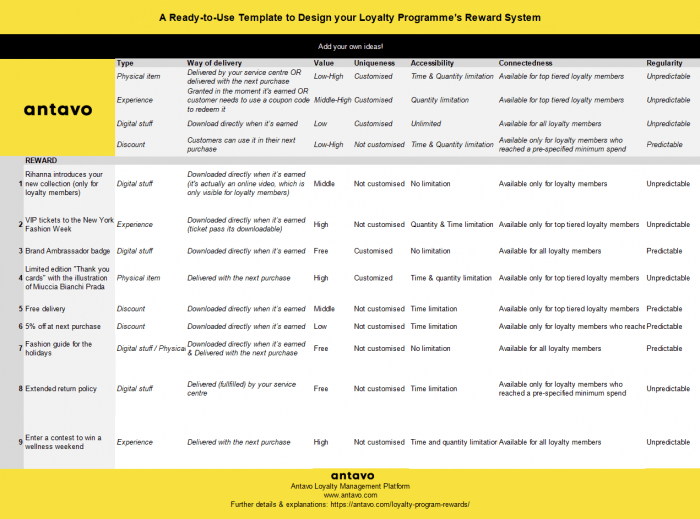 We included a template here, which can help you design your loyalty program reward system. Download it here. A healthy reward catalog consists of a wide variety of incentives, ranging from general discounts to experiential rewards exclusive to your brand, such as VIP rewards or signed greeting cards. Loyalty platform: Whether you buy third-party plugins, enter into a contract with an expert SaaS loyalty provider, or build your own program, there will be a price tag to consider. 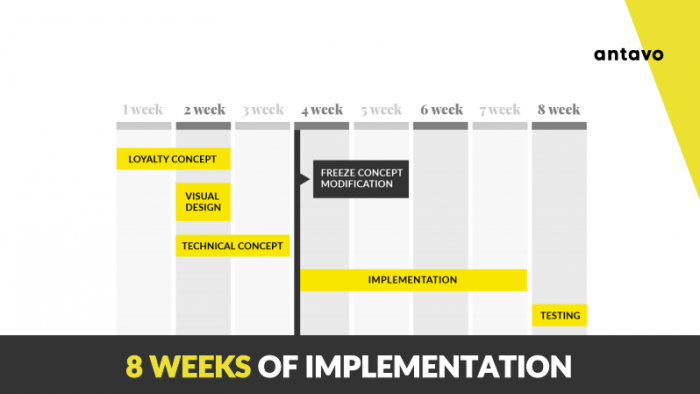 The above implementation flow illustrates the steps required to get your loyalty program on track. Bear in mind that the concept cannot be adjusted in perpetuity, because that would disrupt the execution phase. Having a loyalty program is one thing, but making it a success story is another. That’s why your advertising budget should also be considered from the very beginning. Arrangements: Come up with design elements and slogans that align with your brand (e.g. visualize customer levels, rewards or activities, and use language that creates an feeling of exclusivity). Campaign launch: Announce your loyalty program launch in a newsletter, run Facebook ads, use retargeting, Google Adwords, or even create a promo video to drive signups. Lifetime management: Send follow-up emails, continue your promotions (advertise new rewards and program additions), run contests, and organize special events, which focus on increasing member engagement. 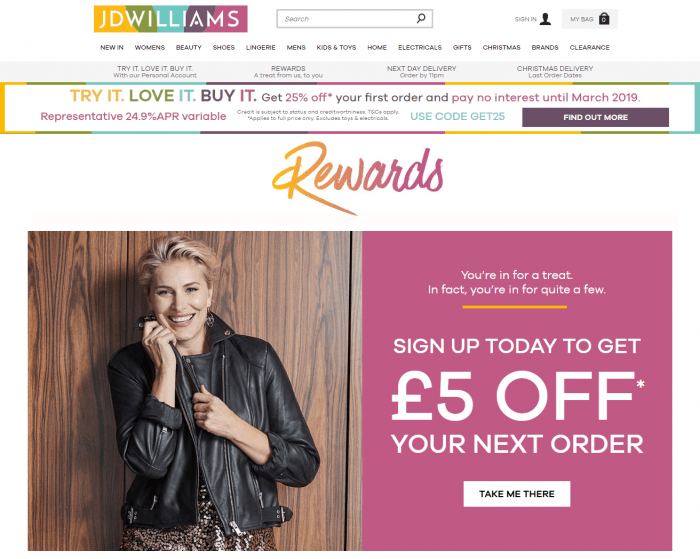 JD Williams put extra effort into designing their reward subpage to match the tone and color scheme of their online store perfectly. After launching your loyalty program, the manager of the loyalty program will have daily and weekly tasks with the loyalty program, and need to think on longer term strategy (an area we help you clients with in every 3 months). Run campaigns in the program: If rewards or activities run out or get boring, you’ll need to create new ones based on customer preferences. Analyze the results: Work with your finance team or your loyalty provider’s consultants to understand the results. From there, you can adjust program elements and communication to optimize those results. Antavo’s Customer Success team would help you understand both. Customer support: Answer customer questions and treat your most loyal customers with extra-special care. This principle explains why many fashion brands provide an exclusive customer service line for top-tier customers. 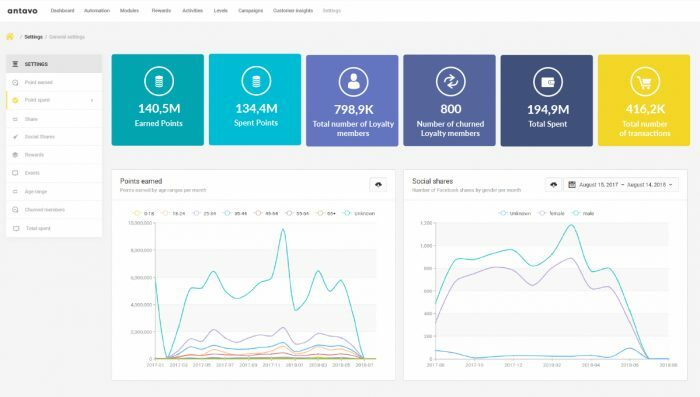 Antavo’s loyalty platform offers a marketer-friendly dashboard that displays reports and analytics in real-time. Despite the careful preparation, many companies worry about whether they will see a return on their investment. When asked about the topic, I always point out that loyalty programs – when done right – will help your business grow. If you have a clear KPI and a set target, measuring a loyalty program’s success is easy. Lacking a customer retention tool can give an advantage to your competitors. Customers ask for a loyalty program because they want to be appreciated for their loyalty. Knowing the theory behind loyalty program costs is half the victory, but I wanted to give you some practical advice too. And no one’s more knowledgeable about this topic than our brilliant in-house loyalty strategist, Timi Garai. Here are some more tips that Timi shared with us. Create coupons with a minimum spend limit to ensure that loyalty discounts don’t hurt your margins. This value should depend on your margins and product pricing. It’s better to start off strict and adjust the details later, as customers would see it as a sign of good grace on your part. Involve other brands that provide a different product or service as reward providers in your program. It’s free advertisement for them and helps you provide relevant rewards to your customers. Avoid showing open favoritism towards top-tier customers at store locations. Practices such as providing VIP cash registers can brew anger and dissatisfaction among other shoppers. Sweepstakes are alluring and capable of mobilizing every participant within the program, though you only need to give the prize for a handful of lucky winners. Points, credits, or whatever currency you use in your loyalty program are considered to be the most optimal reward for a sweepstake, because customers can spend them on anything their heart desires. Always plan your strategy with care and foresight, as cancelling a fan-favorite loyalty program can lead to backlash from your audience, and your sales will drop, too. Those are the basic costs you should consider when planning your loyalty program. If you would like to consult with an expert on loyalty program budgeting, ROI and optimization, our team is here to help. Book a demo with us to learn more. If you would like to dig deeper, and learn more about Budget Planning, download our “Budget Planning 101 for Loyalty Programs” ebook.